Will of Rev. Thomas Goddard, will dated 1731, proved 1731. PROB 11/644/347 in [NA.UK]. Transcript in [MGH, 1910-11], which also includes extra Goddard information. See p.104 and p.105. Rev. Thomas Goddard in [Ollard, 1950]. General Thomas Goddard in [DNB]. General Thomas Goddard in Dictionary of Indian Biography. Proof that our Capt. 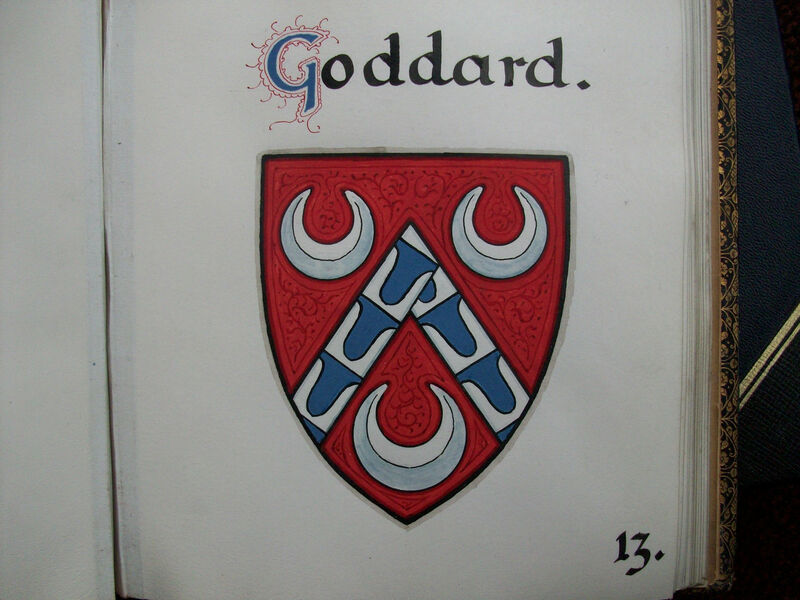 Thomas Goddard is son of Rev. 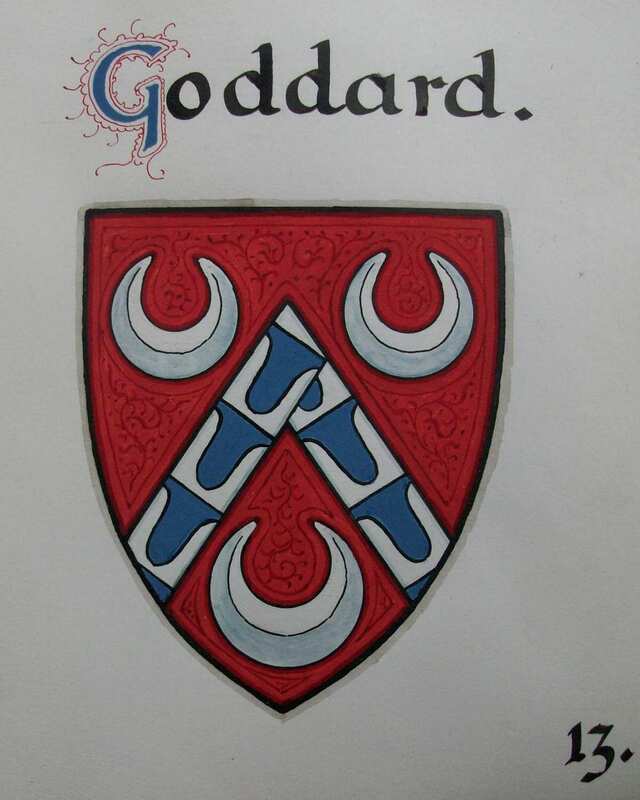 Thomas Goddard, son of Edward Goddard, MP. Extract from p.2 of letter of 1806. He was educ St Mary Hall, Oxford, and Magdalen College, Oxford. BA 1692. Rector of North Wraxall, Wiltshire (see map). Appointed 7 Oct 1697, succeeding Rev. John Beale. He mar 30 Sept 1700, North Wraxall, to Ann Beale [or Anne, born 9 Nov 1680, dau of Rev. 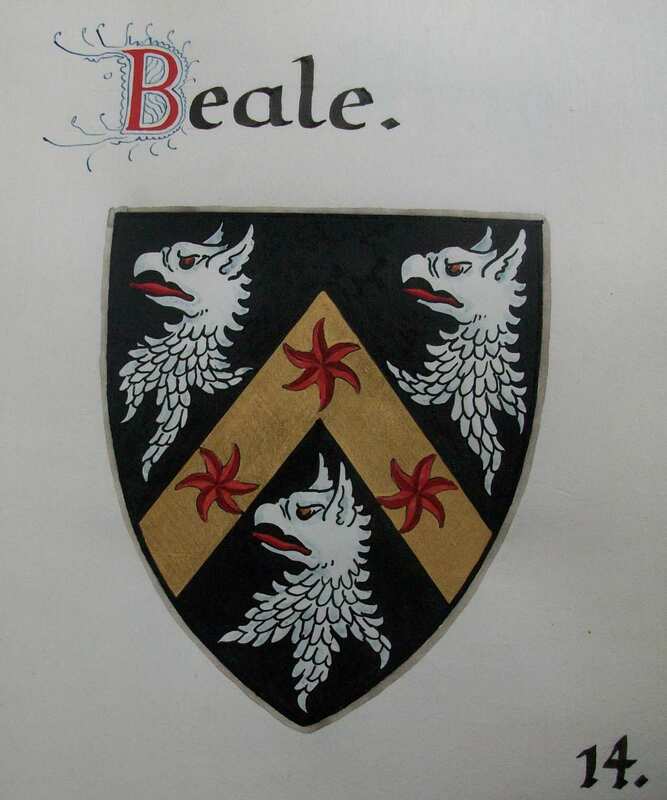 John Beale]. Rev. Thomas got MA from Oxford in 1705. 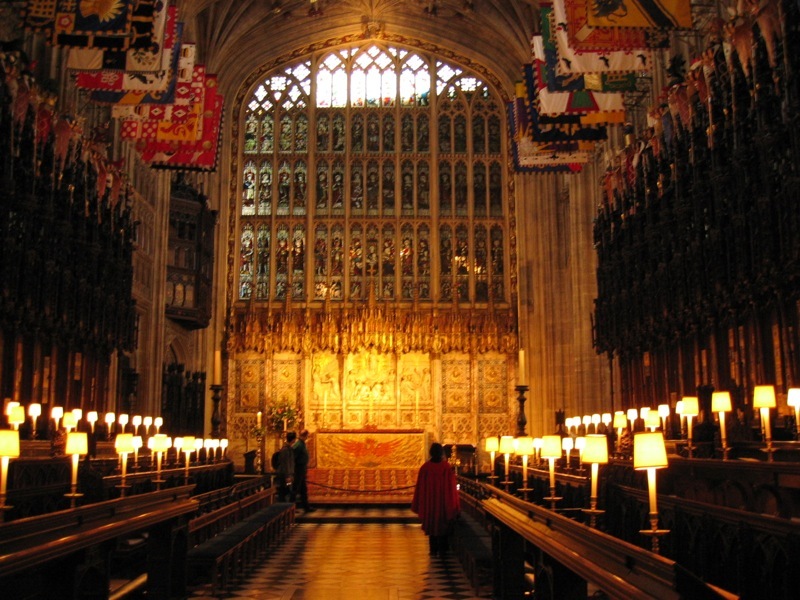 He was appointed 26 May 1707 to the 5th stall in St George's Chapel, Windsor Castle. Resigned from North Wraxall 19 May 1708. Rector of North Tidworth, Wiltshire (see map) from 1708 to death 1731. His mother's family had owned the manor in South Tidworth since 1650. At this time, his uncle John Smith the politician (died 1723) owned Tidworth House, South Tidworth. 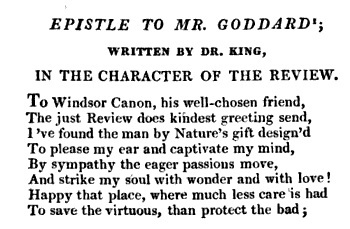 See "Epistle to Mr. Goddard", a poem addressed to him by William King in 1710. 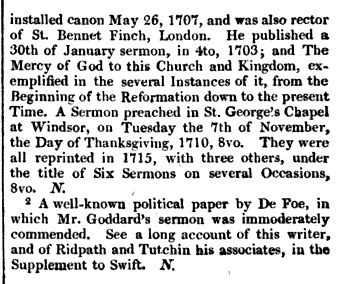 Rector of St Benet Fink, London, 1725. Ann died 27 Nov 1727, age 47 yrs. See his will dated 14 Apr 1731. He died 10 May 1731, or 12 May, age 57 yrs. Probate 28 May 1731. Probate book has date "vigesimo octavo die mensis maii" (twenty eighth day of the month of May). He mar 1729 to his 1st cousin Elizabeth Goddard. She was heiress of the Goddard estate of Hartham, Wiltshire. He is not listed in father's will of 1731. Elizabeth died 1783, buried at Eltham (where her dau lived). She mar Sir William James, 1st Baronet. They lived Eltham, near London. He died 1783, bur at Eltham. Anne inherited the Goddard estate of Hartham, Wiltshire. She built a new house, Hartham Park, completed in 1795. She died 1798, bur at Eltham. mar Thomas Parkyns, 1st Baron Rancliffe and had issue. bur 17 Oct 1702, North Wraxall. bur 1 Sept 1704, North Wraxall. bur 1 Apr 1705, North Wraxall. bur in St George's Chapel, Windsor Castle. mar her 1st cousin Edward Grinfield and had issue. 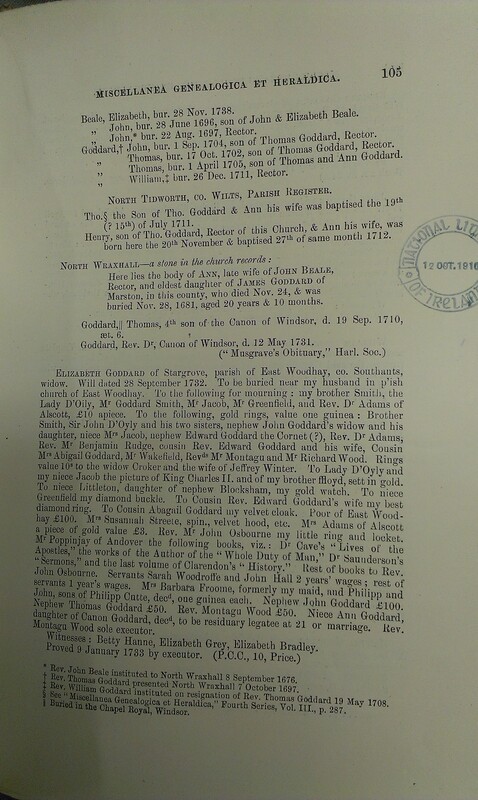 Mentioned in father's will of 1731.
bapt 19 (or possibly 15) July 1711, North Tidworth, Wiltshire. 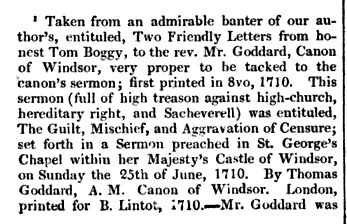 "Tom" in letter of 1806. He was the 4th child called Thomas. He is mentioned in father's will of 1731. 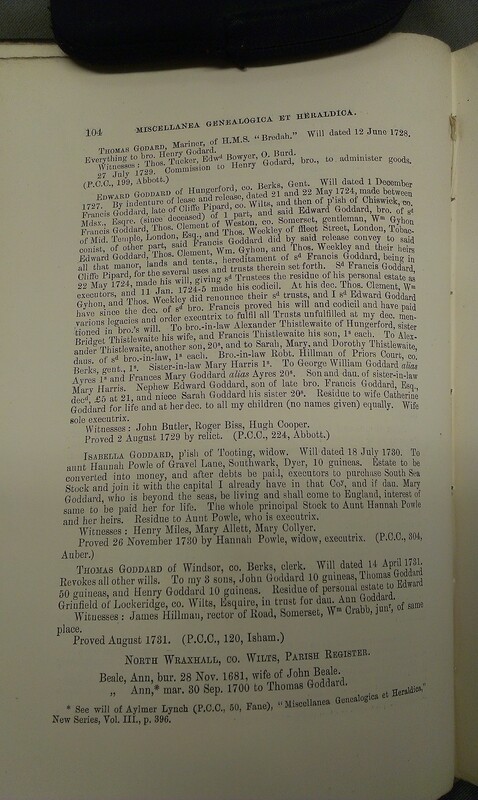 No Thomas is listed in Goddard of Hartham in [Burkes LG, 1838]. However we know a Thomas existed from his baptism and his father's will. And letter of 1806 is proof that this is our Capt. Thomas Goddard. Famed for his actions in the First Anglo-Maratha War (1775-1782). This was fought between the British East India Company (who were defeated) and the vast Maratha Empire in India. The East Indiaman ship the General Goddard (1782) was named after him. He died 1783, buried at Eltham, near London (where his cousin lived). 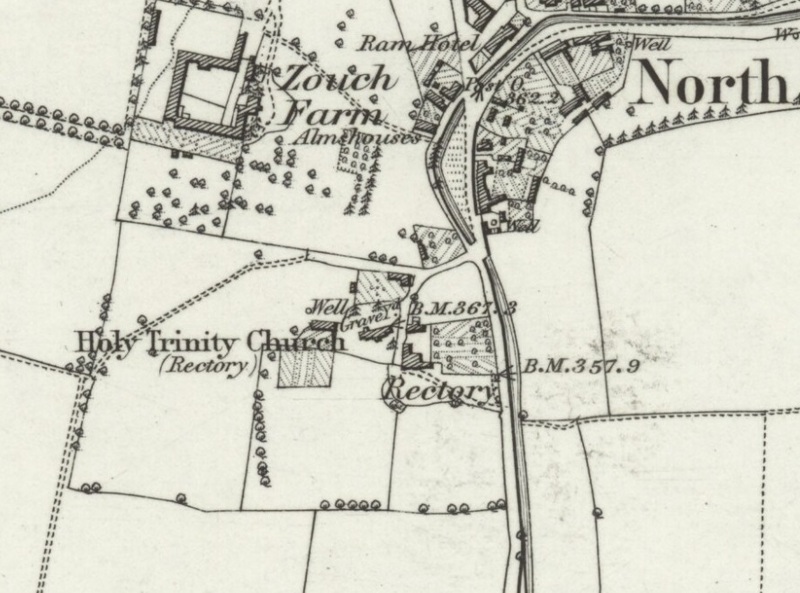 North Tidworth church and rectory on 1873 map. Rectory might have been different in Goddard's day. 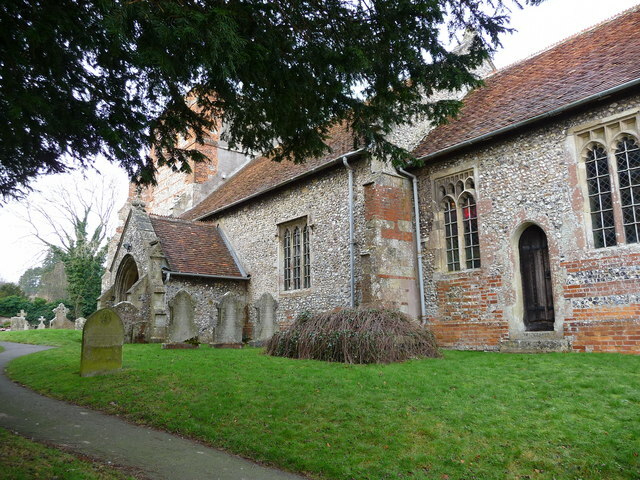 Holy Trinity Church, North Tidworth, Wiltshire. Rev. Thomas Goddard was Rector here 1708 to 1731. See more photos on Geograph and Wikimedia Commons. 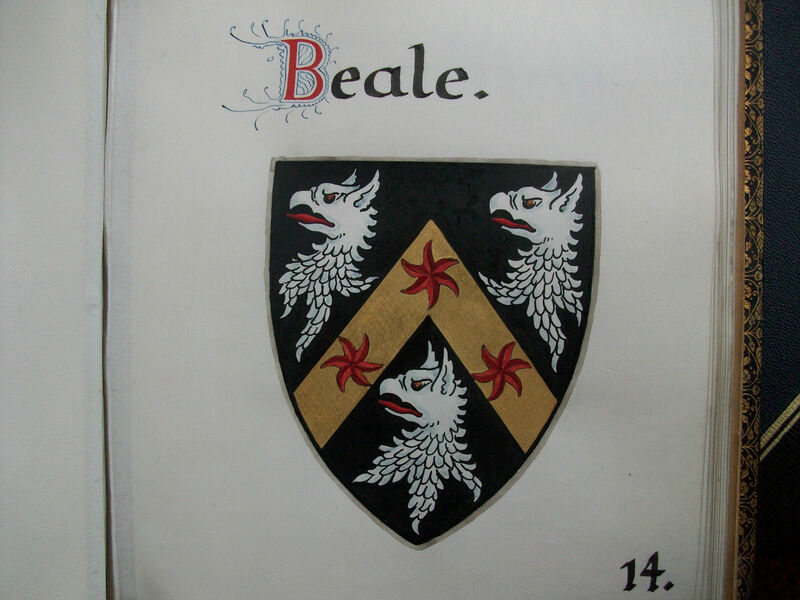 Arms of Goddard and Beale. From the arms of the 32 ancestral lines of James Franklin Fuller, made out in 1909 by the Dublin Office of Arms. The will of Rev. Thomas Goddard, 1731. Mentions his sons John, Thomas and Henry. Rev. 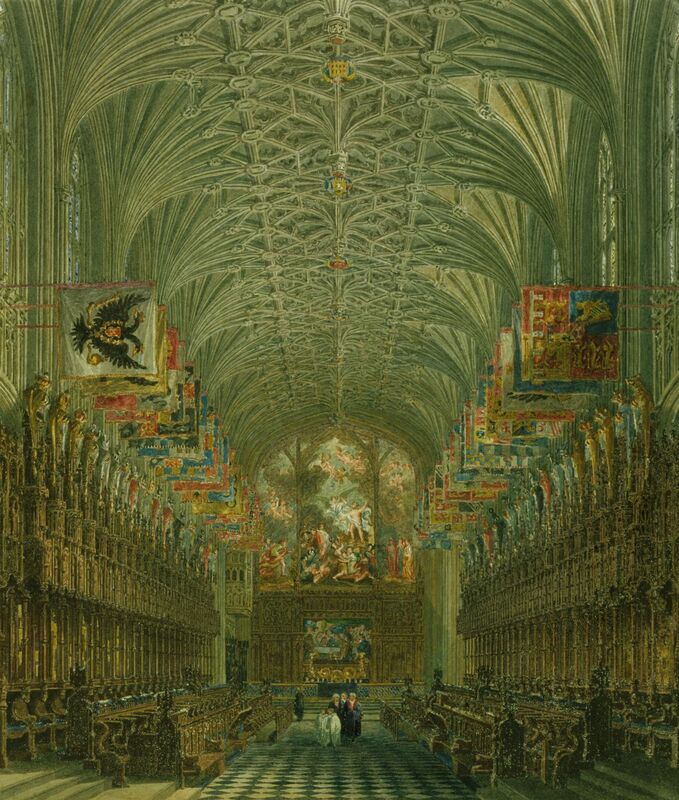 Thomas Goddard in 1707-31 was Canon of the 5th stall (out of 12 Canons' stalls) in the choir of St George's Chapel at Windsor Castle. 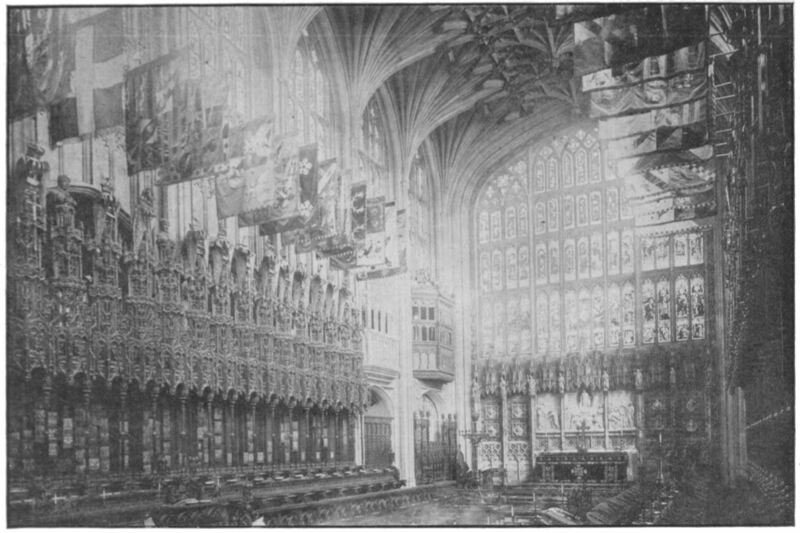 The choir of St George's Chapel, Windsor Castle. Picture of 1818. See full size. From here. See 1910 photo looking the other way, towards the window. From here. See 2004 photo looking towards the window. From here. There are plates to the Knights of the Garter on the stalls, but not to the Canons. See reference works. "A Second Letter from Tom Boggy", 1710. [BL] General Reference Collection DRT Digital Store 11858.ee.16. See here. A poem addressed to Rev. Thomas Goddard by the poet William King in 1710. 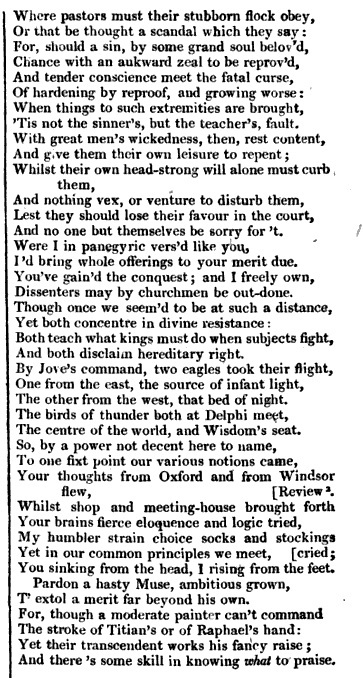 This is in the chapter on William King in Lives of the Most Eminent English Poets by Samuel Johnson (1779-81). Above is from p.305 of vol.9 of 1810 edn. The notes in the 1810 edn.